Our Lesson Program would like to welcome beginners through advanced riders. Come join our riding team and learn how to ride Western or English Riding style.! We know everyone learns at their own speed and our horses are patient, kind, and very receptive to their rider which makes it a great riding experience for everyone! In our lesson program we offer classes that teach Western Pleasure, Trail Riding, Gymkhana, Trail Trials, English Pleasure, and Hunter Jumper classes. We at Heavens Hoofprints Strive to create a riding program that is fun and encourages all our riders to continue to grow and be challenged to new levels of riding. We offer a variety of different programs to appeal to all kinds of riders. We also include camps, off site over night camping, off site showing, trail riding, and holiday celebrations. 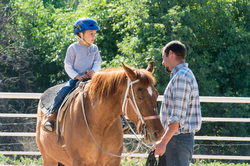 Horseback riding is adventurous and rewarding and should be experienced by all those that love horses. We do offer all new students helemts to wear, grooming equipment to use for the lesson horses, and riding equipment for the horse and rider. It is our goal to help our riders not only learn how to ride but learn the importance of investing in their own equipment, which will last a life time. We encourage all riders to purchase their own helmet, riding boots, riding breeches, and gloves by the end of their beginner course. It is important that students have gear that fits proerly for their safety and comfort. We also encourage students to start looking and trying out saddles that they would like to purchase and ride in for extended period of time. Even if your student grows out of their saddle, a well made saddle always holds its value and can be displayed, re sold, or passed on to another rider.